The UO released drawings, animated video and a model of the planned structures scheduled for completion in 2020. 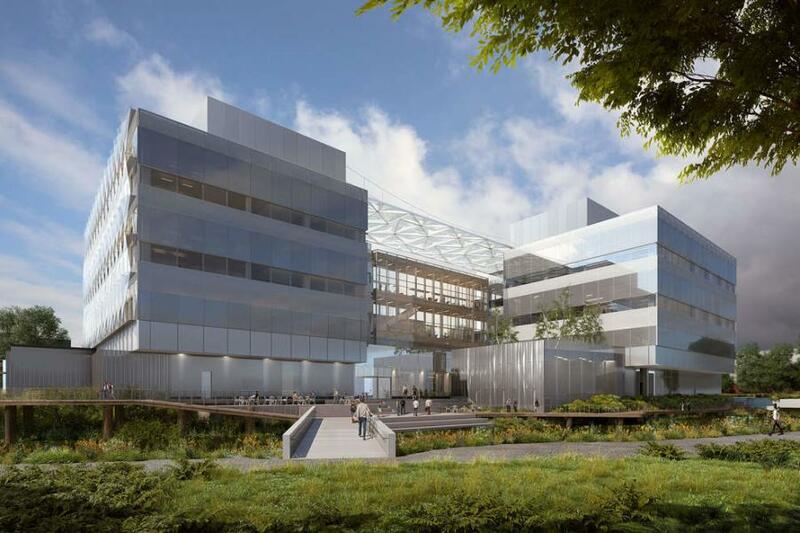 A pair of four-story glass towers along Franklin Boulevard in Eugene, Ore., will be the first buildings of the Phil and Penny Knight Campus for Accelerating Scientific Impact at the University of Oregon, the university revealed Oct. 27. The UO released drawings, animated video and a model of the planned structures scheduled for completion in 2020. A skybridge will connect the buildings, which will have 160,000 sq. ft. of combined space, to existing UO science labs and classrooms. “Thanks to Phil and Penny Knight's generosity we dreamt big,” UO President Michael Schill said at the Ford Alumni Center, where the plans were presented to the public. Eugene Mayor Lucy Vinis, among the crowd of about 200 people, said the new buildings will be “such a change” from the existing buildings along the busiest street passing the UO. “It's a stunning transformation of Franklin Boulevard,” she said. A year ago the Knights committed to donating $500 million to the UO — the alma mater of Phil Knight, co-founder of Nike — to fund half the $1 billion campus for science innovation. His wife, Penny Knight, joined him in committing the money. Funding from the Knights will come in $50 million increments over a decade. The state of Oregon has dedicated $50 million in bonds to the Knight Campus, and the UO will ask for another $50 million from lawmakers in 2019. The UO also is looking for money from donors for the campus. A third and final building has yet to be designed. All together, the buildings are expected to encompass more than 200,000 sq. ft.
Bora Architects of Portland and Ennead Architects of New York designed the buildings revealed Oct. 27, according to the UO. Hoffman Construction of Portland will be the general contractor. The UO expects to break ground on the project in early February, the UO said. The first phase of construction is expected to cost $225 million. The university has been expanding its real estate holdings between Franklin Boulevard and the Eugene Millrace over the past year to make room for the Knight Campus, which will replace office buildings and restaurants. UO officials traveled to Harvard, MIT and Stanford to visit other new science buildings, Acting Knight Campus Executive Director Patrick Phillips said. The Knight Campus buildings will feature spiral staircases and offices close to laboratories, making it easier for students, researchers and faculty to collaborate. “Our innovation is bringing everyone together,” Phillips said. The Knights didn't attend the Oct. 27 event, but Phil Knight issued a statement through the UO. Knight ran on the Ducks track team and graduated from UO with a business degree in 1959. He co-founded the firm that became Nike with UO track coach Bill Bowerman. Nicole Zavoshy, 22, a UO bioinformatics and geonomics master's student, said she'll have finished her studies before the buildings open. Still she was curious about the Knight Campus and came to see the designs with a friend. Zavoshy said she's enthused about what the campus will provide for future science students at the university. She said she particularly liked the skybridge after looking at the drawings. “That is really significant because it kind of integrates our past and future,” Zavoshy said.